NaMo’s declaration as PM candidate of BJP for 2014 Lok Sabha elections – will not go well. It has been stamped by astrologers and Raj Nath’s personal astrologer to declare NaMo as the PM candidate on 13th September 2013 at 12:15 in Delhi. My observation of the Mahurat Kundali does not agree with this time. Ascendant Lord Mars is debilitated in the horoscopes and under the aspect of Saturn (Shani) a restrictive dry planet, which will bring in hurdles, delays and problems in this endeavour of BJP to come to power with NaMo’s popularity. Moon is Void of Course and in Kem Druma yog, this augurs unwelcome, rowdy and unruly behavior of the masses, public and followers of BJP and Narendra Modi, resulting in a lot of disciplinary actions resulting in separative actions, breaking down BJP. 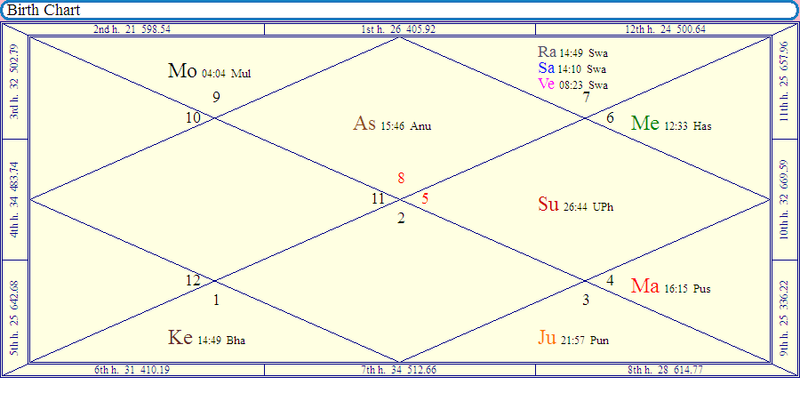 The seniors (not only LKA) but others too ma have a separatist and detached reaction with the conjunction of Shani and Rahu, in the 13th house of losses aspecting Moon and Mars. Sukra too as the lord of the twelfth house is stronger than the ascendant lord or the Moon lord (Jupiter), indicating losses due to this declaration. Sun alone in the tenth house will not do anything good, contrary to the belief that Sun in the tenth house brings power and authority. Moon’s void of course state indicates that the mentality is vaccumed and separatist in nature with no direction to go to, leaving everything to chance and taking last minute corrective decision, n matters related to Narendra Modi. This does not mean that my earlier prediction done some 3-4 years back, that Narendra Modi will become the PM of India in 2014 elections will go wrong, because of this wrong timing of declaring him the PM candidate. The path to his march to power will now be strew with more difficulties leading to possible loss, if the other candidate of PM has a better horoscope than Narendra Modi, though I still stand by m other earlier prediction that Rahul Gandhi is not PM material at all and if he is declared as the candidate for PMship he will not win against NaMo. May peace prevail and India gets the leadership it needs.